Not surprisingly, most cases before the Supreme Court involve high stakes. The justices can assure this by taking a small and selective caseload each term. With so many potential cases petitioned to the Court on such a wide range of issues, the Court really has the pick of the litter in terms of possible cases to hear. The types of issues involved in cases also range greatly, from individual or group rights to the limitations on actions by federal and state actors. Many of these cases also have direct or indirect financial implications. The extent that these cases will affect the economy is often not entirely clear at the outset of cases, but the potential areas of impact are often demarcated through cases’ progress in the lower courts. A certain set of groups is highly active within the band of cases with direct financial implications. These groups have an interest in seeing these cases proceed to the Supreme Court and in the eventual case outcomes. This post identifies these groups and the extent of their involvement in the initial stages of Supreme Court litigation. Specifically, it tracks their involvement as amici for petitions in cases with direct financial implications that the justices later heard on the merits between the 2008 and 2018 Court terms. The Court heard 704 oral arguments between the 2008 and 2017 terms and has a slate of 71 possible arguments on the calendar for this term. Out of these 775 cases, 180 or just over 23% were coded as having direct financial or business implications. Within this subset of cases 118 or about 65.5% had at least one cert stage amicus brief. Cert stage amicus briefs are seen as a way to provide the Court with an additional signal or signals that a case warrants its review. They are risky endeavors though as they have little independent value if the Court rejects a case. They can also be contrasted with amicus briefs on the merits which are more prevalent, but are only tied to cases already on the Court’s merits docket. A good example of such a case is South Dakota v. Wayfair Inc.from last term. In this case, the Court overruled several of its prior precedents by establishing the principle that states can require out-of-state sellers with no physical presence in the state to collect and remit sales taxes on goods the seller ships to consumers within the state. Direct and indirect effects on financial interests from this case will be and are numerous and dispersed across the country. A decision that will likely have a narrower although not insignificant economic impact on businesses is this term’s Helsinn Healthcare S.A. v. Teva Pharmaceuticals USA Inc. Here the Court decided the relative rights to put an invention on sale between an inventor and a third party who is obligated to keep the invention confidential. Conversely there are many cases which may affect have secondary effects on financial interests that weren’t captured in this dataset. An example of such as case is last term’s Lucia v. Securities and Exchange Commission. In that case the Court decided that SEC administrative law judges are “officers of the United States” and so they are subject to the Constitution’s appointments clause. Even though the decisions of these judges will inevitably have down the line financial implications, because the decision itself does not directly affect financial interests it was not coded as having a direct financial interest. The majority of cases coded as having financial interests also have cert stage amicus filings. The graph of business related cases with financial interests per term since OT 2008 along with business related cases with financial implications with amicus filings highlights this point. Interestingly, although the total number of such cases has fluctuated over the years in a manner unrelated to changes in the Court’s overall docket, the number of such cases with cert stage amicus filings has remained relatively constant. The implication here might be that groups with limited resources tend to focus on a certain number of cases each term, and the groups’ filings tend to cluster within specific cases. When we look at cases across these terms with financial interests that have the most cert stage amicus filings, the Wayfair cases leads the pack by a significant margin. In fact, groups filed seven more briefs in Wayfair than in the case with the next greatest number of briefs, Am. Elec. Power Co. v. Conn. The Helsin Healthcare case leads the way this term with ten cert stage amicus briefs which also places it with the fifth most such briefs across all cases in this set since 2008. 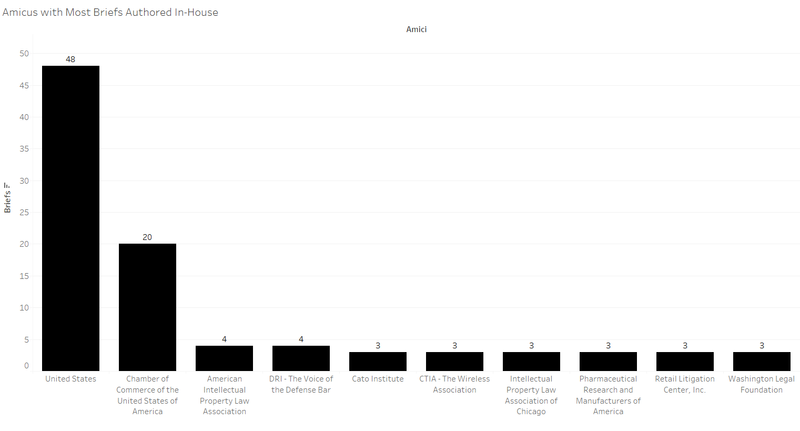 Several interest groups dominate the field in terms of filings within this case subset. The groups with the most such filings since 2008 are depicted below. The United States, the most frequent amici across all Supreme Court cases also leads the way in terms of filings within this case set. 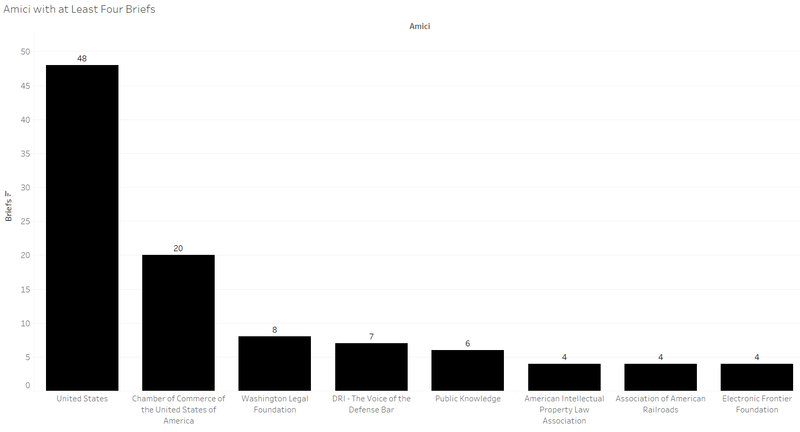 The United States Chamber of Commerce though is the interest group with not only the most such cert stage filings, but with more than twice as many as the group with the next most filings, the Washington Legal Foundation (which had eight such briefs). Other leaders in this filing area were DRI – The Voice of the Defense Bar and Public Knowledge. Some groups have more success on a term by term basis than others. 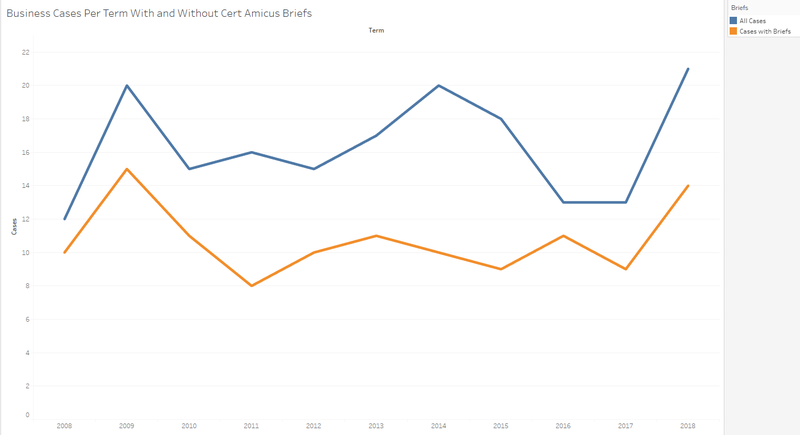 To gauge this type of success, the next graph tracks groups that have had at least two cert stage amicus briefs in a term in cases the Court granted between the 2008 and 2018 terms. 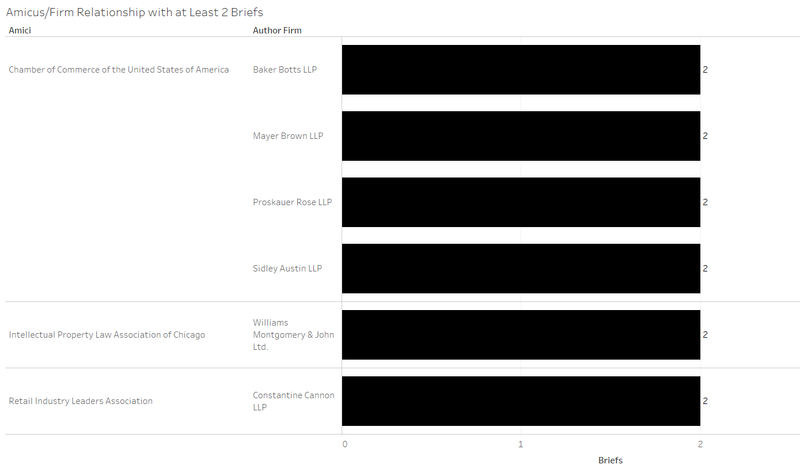 After the United States, the US Chamber of Commerce leads the way with six terms of two or more cert stage amicus briefs in this set of granted cases. The only other group with more than one term of at least two briefs in granted cases was the Electronic Fronteir Foundation. When groups set at to file cert stage amicus briefs they need to decide whether they will author them internally or engage an outside law firm to assemble the brief. The next several figures observe the firm / interest group relationships. The first such figure tracks the firms whose attorneys were counsel of record on the greatest number of briefs in this set of cases. Sidley Austin led the way with six such briefs and was followed closely by Mayer Brown, Winston & Strawn, and Shook, Hardy, and Bacon who each authored five briefs in this set. 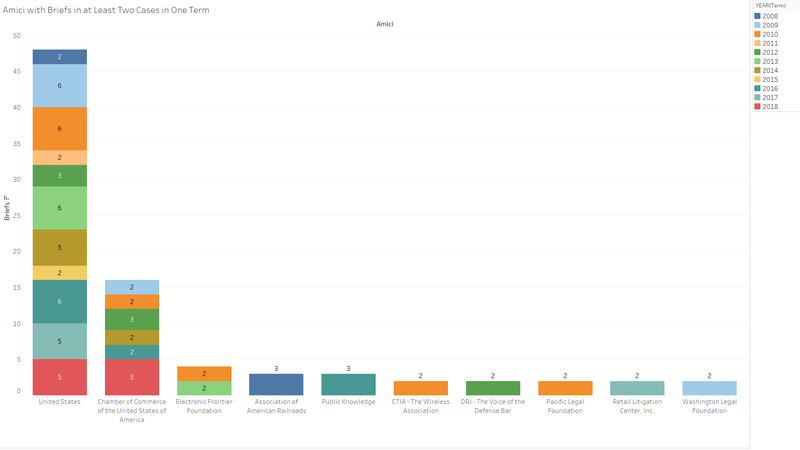 On the other other end of the spectrum the next graph shows the groups that decided upon internal counsel of record on the most briefs in this set. The United States has a big advantage in this area as the Solicitor General’s Office tends to author all of its briefs internally. The Chamber of Commerce, which has the next most such brief authorships, has five times as many as the groups with the next most internally authored briefs — DRI – The Voice of the Defense Bar and the American Intellectual Property Law Association which each have four of these internally authored briefs. Finally, certain amici link up with particular law firms for authorship relationships. A handful of amici went to the same firm more than once for cert stage amicus briefs in granted cases within this set. These relationships are shown below. The only group with multiple such relationships for this period is the US Chamber of Commerce which had four firms that each authored two cert stage briefs for the Chamber in granted cases between OT 2008 and OT 2018. These four firms are Baker Botts, Mayer Brown, Proskauer Rose, and Sidley Austin. In addition to these firms, Williams Montgomery authored two briefs in this set for the Intellectual Property Law Association of Chicago and Constantine Cannon authored two briefs for the Retail Industry Leaders Association. 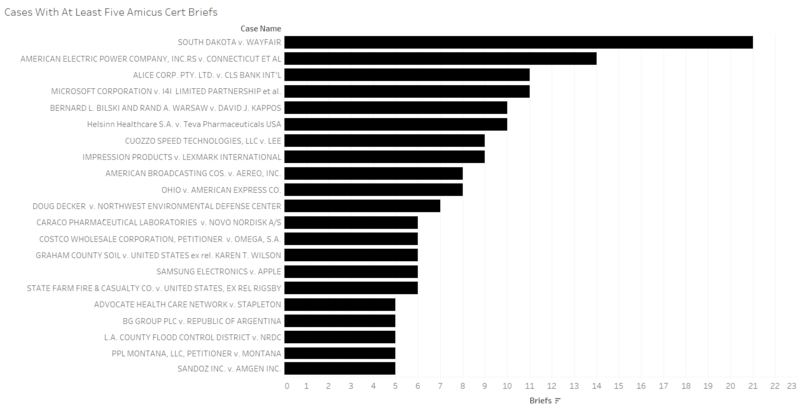 A main takeaway from these data and analyses is that the US Chamber of Commerce is a filing leader in this area as it effectively files cert stage briefs in a high level of granted cases with distinct financial interests. The Chamber, with its wide reach is one of the top amicus brief filers on a term-by-term basis across all cases before the Court. 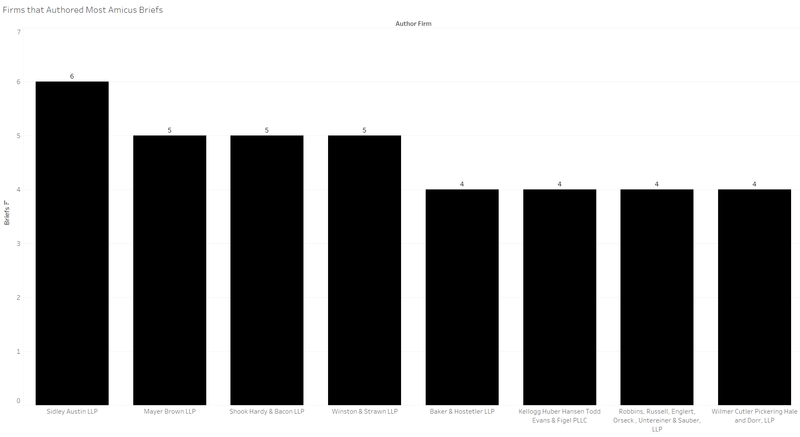 Other groups that file fewer amicus briefs on the aggregate have been highly successful with their choices of cases for cert stage amicus filings in this area. These groups include the Electronic Frontier Foundation, the American Intellectual Property Law Association, the Washington Legal Foundation, and DRI – The Voice of the Defense Bar. Several big law firms tend to take on large authorship roles in area including, most notably, Sidley Austin. While the Chamber of Commerce will likely lead the way for amici in this area for the foreseeable future, especially when focusing on cases with financial interests, other groups like the ones just mentioned may play large roles in helping to define the Court’s merits docket if they continue to file cert stage amicus briefs in cases the Court later grants for merits review.